Ref No Grave or Memorial / Rhif cyfeirnod bedd: Plot: 11. Row: K. Grave: 14. Medals Awarded / Medalau a ddyfarnwyd: British War Medal, Victory Medal, Territorial Force War Medal. Herbert Edward Abbott was born on 30 October 1899 in Liverpool and baptised on 9 November 1899 at St Peter’s Parish Church, Church Street, Liverpool. His parents were Herbert Edward and Alice Ann Abbott, his Grandparents – John William Abbott and Alice Ann Wells. During 1900 the family moved from Liverpool to Rhyl, Flintshire, and lived as Boarders at the back of 54 Wellington Road, Rhyl. 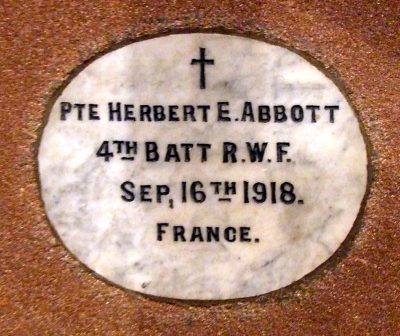 The head of the family was Herbert Edward Abbott aged 27, who was employed as a Boot Maker. His wife Alice Ann Abbott aged 26 and their son, Herbert Edward Abbott aged 1 year. Also living with them at that time was Herbert’s sister, Nellie Abbott aged 17 years. On 3 August 1903 the family moved from Rhyl to live at 2 Summer Hill, Brynford Street, Holywell, Flintshire. Happily, Alice Ann Abbott and her children are eventually reunited and returned to live at 2 Summer Hill, Brynford Street, Holywell. When Herbert Edward Abbott reached the age of 13 he obtained employment as a Trainee Spinner at the Welsh Flannel Mill, Greenfield Road, Holywell to help with the families finances. (His work entailed spinning the yarn to make cloth). Some 12 months later on Monday 6 April 1914 aged 14 years 6 months he enlisted with the Royal Welsh Fusiliers Territorial Force at the Drill Hall, Halkyn Street, Holywell. His Attestation Certificate -British Army WW1 Service Record can be viewed on (www.ancestry.co.uk). On enlistment he is described as 5’1″ tall, Chest Measurement 31″, Expansion 2″. His physical development was described as good and according to the Recruitment Officer and Medical Officer he was fit for Military Service. On Wednesday 5 August 1914 at the outbreak of the First World War Herbert was recorded as being ‘Embodied’ into 5th Battalion Royal Welsh Fusiliers. His postings during his early years with the Battalion are not known, but we do know that on Thursday 15 April 1915 he was admitted to a Military Hospital suffering from Pneumonia. He was a patient in the hospital for three months, being discharged on Friday 23 July 1915, when he returned to his Unit. It is known that he served with 13th Battalion, Royal Welsh Fusiliers as a front line soldier during three of the Battles of the Hindenburg Line, namely, The Battle of Albert, The Battle of Cambrai, before being severely wounded during the Battle of Epehy. He died of wounds received in action on Monday 16 September 1918, whilst in hospital at Rouen. He was buried in St. Sever Cemetery Extension, Rouen. St. 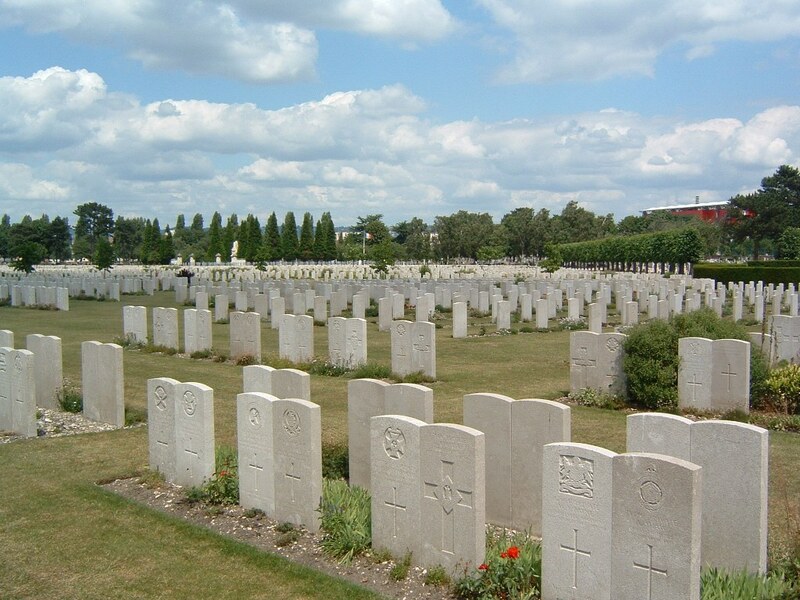 Sever Extension Cemetery, Rouen, France. During the First World War, Commonwealth camps and hospitals were stationed on the southern outskirts of Rouen. A base supply depot and the 3rd Echelon of General Headquarters were also established in the city. Almost all the hospitals at Rouen remained there for practically the whole of the war. They included eight general, five stationary, one British Red Cross and one labour hospital, and No.2 Convalescent Depot. A number of the dead from these hospitals were buried in other cemeteries, but a great majority were taken to the city cemetery of St. Sever. In September 1916, it was found necessary to begin an extension, where the last burial took place in April 1920. His personal effects, which consisted of a metal cigarette case with a broken clasp, letters, metal ring, purse with clip badge containing a few coins, book, wallet, photographs, post card, and a notebook were forwarded to his mother at 2 Summer Hill, Brynford Street, Holywell on 9 October 1919. When returning the receipt to Army Records at Shrewsbury, Mrs Abbott had written at the bottom of the form – ‘Thank you very much as I now have something which belongs to my dear son’. Whilst carrying out research into the life of this soldier I discovered what a remarkable, brave and resourceful young man he was. He was a credit to his family, Regiment and Country. On 31 March 1919 a payment of £9.17s.9d was made by the War Office to Alice Ann Abbott, this being monies owed to her son. On 10 December 1919, a further payment which is recorded as a War Gratuity of £19.0s.0d was also made to her. There is no Flintshire Roll of Honour card for him at the County Archives Office, Hawarden. However, he is commemorated in perpetuity by the Commonwealth War Graves Commission.